As a tree grows higher, tree branches must be longer and larger in diameter. Depending on the position on a trunk, a branch must be larger (bottom branches), or smaller (top branches). In other words, some parameters change under the influence of others. The system has a special mechanism called Affects, which can be used to set up the dependencies mentioned above. Allows to manage the list of affects. Makes a duplicate of the selected affect in the list. 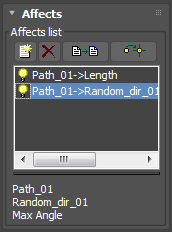 Allows to redirect the affect to another parameter. The list will display available parameters as the system can determine itself which parameter can be affected. The user must choose the necessary parameter. Allows to set the range of the affecting parameter. 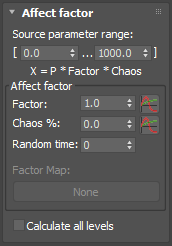 This demonstrates how the calculation is made, so the X parameter will be calculated by multiplying by P (the source parameter), Factor and Chaos values. Chaos will represent the random disperse of Factor's value. Allows the user to customize the affecting coefficients. Multiplication factor itself. The dynamic change of the parameter does not occur per se. One needs to use graph representation of this factor by clicking button. The graphic range will be expressed according to the range specified in Source parameter range, i.e. values of the source parameter in the specified range will be expressed in a graph from 0 to 100. For example: The influence occurs from the length of a branch, and the change of some parameter must occur at the length from 10 to 50. Accordingly, Source parameter range is set to be equal to [10.0 ... 50.0]. Then, if the length of a branch is 10, Factor is equal to the value of the graph at point 0, and if the length is equal to 50, then Factor will be equal to the value of the graph at point 100. Accordingly, the entire range of graph Factor will be used in the entire range of lengths of this branch (10...50). Adds random variation of the value Factor to lower side. This parameter adds the random offsets in time up to the specified value. 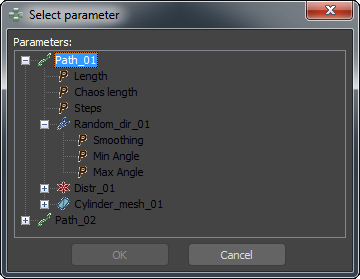 This parameter can be used for animation, particularly for creating chaotic movements (for example, wind animation without Wind animation modifier). Allows to attach the texture as a coefficient. This can be affected from the Surface distributor only. In using the texture, Factor will be used as a scaling coefficient, and the Factor Graph won't be taken into account. When on, the coefficient calculation on all levels, in using multilevel distribution in Path distributor or Path position distributor. When off, the coefficients will be taken from the last level only.